It's almost like Christmas to get an email with a barn quilt photo, after it has arrived at it's new home. I love seeing where the finished barn quilts are hung. This Shooting Star is overlooking a golf course in Okoboji, IA. It was a surprise birthday gift for Rebekah's husband. Thanks Rebekah for sending the photo! These four wooden barn quilts are on their way to new homes. 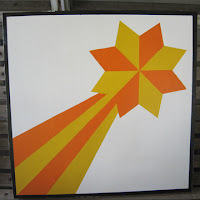 One Summer Wreath 2 foot barn quilt block is going to have a home in Wausau, WI. 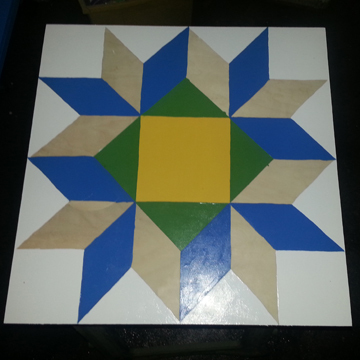 The other Summer Wreath wooden 2 foot barn quilt is on the way to Albert Lea, MN. 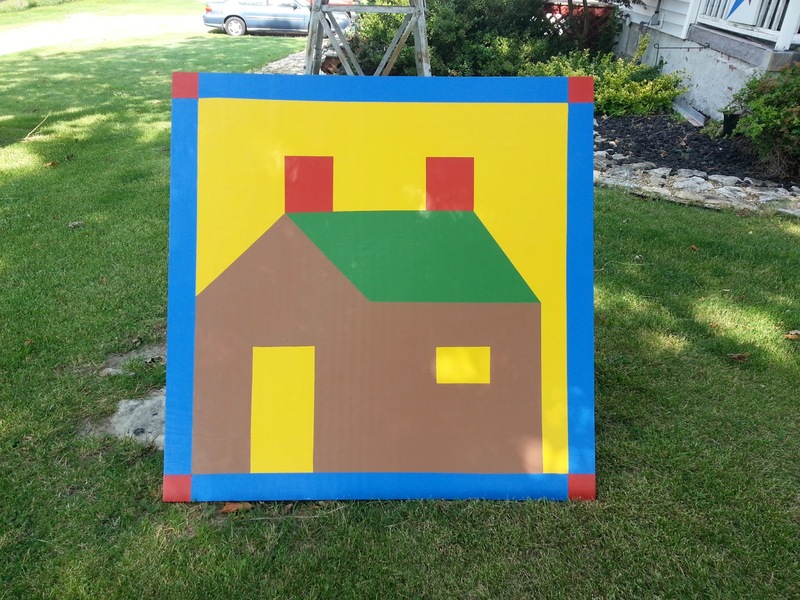 The 4 foot Log Cabin Cottage is going to hang on a real log cabin in Monmouth, IL. 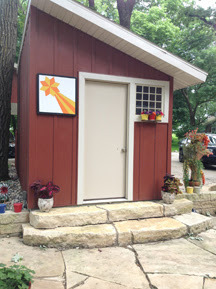 The 2 foot Shooting Star barn quilt will be overlooking a golf course in Okoboji, IA. Thanks to everyone for the orders. 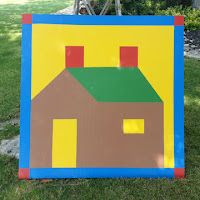 I am starting to paint 4 more quilts so check back often to see the progress. 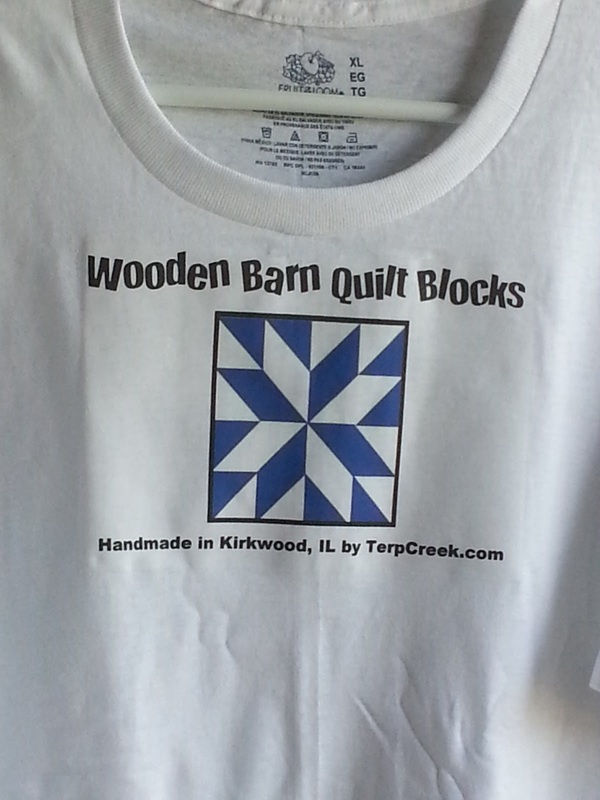 You can now purchase a Wooden Barn Quilt Block Tee Shirt to give as a gift or keep for yourself. The shirt has where the quilt block was made and by who. So add some fun and buy a shirt! 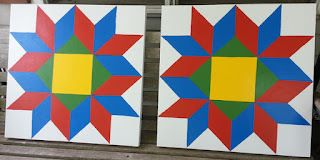 MN and WI Barn Quilts almost done! 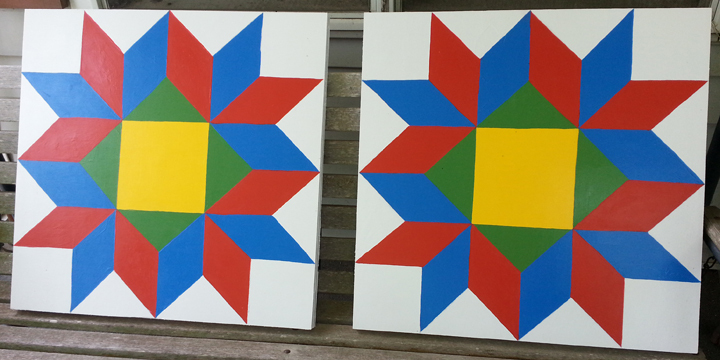 Almost done with the two barn quilts that are alike. One more coat of blue then I will be starting the last color, which is red. One barn quilt is going to WI and the other one is going to MN. The one in MN is going to be hung so the golfers can see it from the golf course. When they are finished and I get the photos of them. I will post the the photos so everyone can enjoy seeing where they are hanging.